Anti-inflammatory helps to calm and soothe irritated skin. Known as The Skin Care Makeup, the Jane Iredale line is so safe and beneficial to use that it is recommended by Plastic Surgeons and Dermatologists throughout the world. 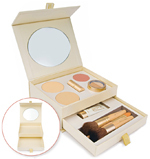 The Starter Kit is a must-have introductory to Jane Iredale’s magical, mineral difference! These state-of-the-art minerals are available in so many shades that there’s one for every complexion no matter what the ethnicity. Jane Iredale includes makeup for the face, cheeks, lips, eyes, concealers, also offering an array of makeup brushes, facial sprays and makeup bags. Call to schedule an appointment for a Color Match Consultation to learn what mineral is best for you. Please be prepared to remove your makeup to enable a proper color match. This consultation does not include a full makeover, but is designed to get you started with the proper mineral powder or liquid foundation color to build your palate around.